Mexico’s history of urban sprawl holds important lessons for policy and leadership in urban development. Photo by Pablo Lopez Luz/Imgur. As some cities tout the benefits of sustainable transport and transit-oriented development (TOD), it is hard to imagine how others could have moved so far in the opposite direction. 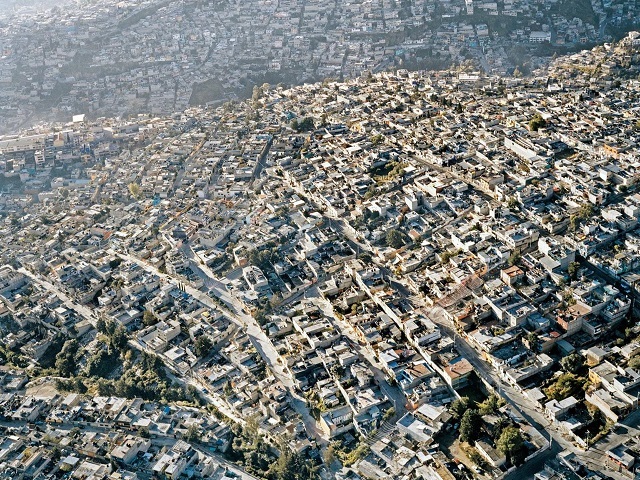 Understanding the combination of shifting responsibilities, lax regulations, and flawed policies that play a role in Mexico’s sprawling cities, for example, holds important lessons not only for Mexico’s future urban development, but also for city leaders across the globe as they seek to build compact and sustainable cities. In the case of Mexico, one lesson shines above the rest: good intentions mean nothing without clear policies and an administrative infrastructure to support them. This story starts with the National Workers Housing Fund Institute (INFONAVIT), Mexico’s largest builder of social housing. INFONAVIT was originally responsible for purchasing land, developing urban projects, building houses, assigning houses to workers, granting credit, and collecting payments. However, during Carlos Salinas de Gortari’s administration (1988 – 1994), housing policies changed. The ejido (an agricultural land grant introduced as a result of the Mexican Revolution) could suddenly become privately owned. This meant that a parcel owner of the ejido property, who previously held only certain cultivation rights, would now have the right to sell his or her parcel to an urban developer. Furthermore, in 1992, INFONAVIT ceased to be a developer and homebuilder and became a financial institution. This created a an environment that encouraged abuse of the system, providing urban developers with an almost unlimited availability of land, lack of federal oversight, and one indicator of success: the number of houses built. Between 1994 and 2000, Mexico faced a horrible economic crisis that pushed annual interest rates on mortgages over 100% in some cases. The middle class was profoundly weakened and social housing programs came to a halt. To stimulate economic growth, then-President Vicente Fox found what seemed like an easy solution – build more houses. This was intended to counteract the several years where no housing was built, generate jobs, and grow Mexico’s economy. Instead, it intensified a lopsided power structure and sent Mexico’s cities into an unsustainable spiral of urban sprawl. The owners of the ejidos signed away their land to developers, providing them with an unexpected source of income. Developers, meanwhile, purchased as much land as possible – regardless of location and accessibility – because municipalities authorized all of the urban complexes that were requested by developers. This prompted a huge influx of housing developments that quickly met demand and then swiftly surpassed it. At the beginning of Felipe Calderon’s administration (2006 – 2012), there were already clear signs of the monumental repercussions of these housing policies. Academic research brought awareness to the enormous amount of money and time spent by people living out on the periphery to access their place of employment. Governments at the local and national level, however, refused to establish minimum standards of location, connectivity, density and mix-used zoning, allowing the trend of dispersion to continue. Between 1980 and 2010, urban population increased by 100%, while urban area increased by 600%. But this trend would not continue for long. First, for many who purchased homes on the periphery, far from jobs and urban services, it became unreasonable to spend 30% of their household income on transportation and lose two to five hours each day commuting. Some returned to live with their parents, or crowded into a small but better located apartment. Additionally, policies governing the Retirement Savings System changed. Now, at the age of retirement, workers who had not already exercised their right to INFONAVIT housing funds can transfer their housing account to their retirement account. This eliminates the incentive for many to buy a second, unnecessary home. Finally, the receding tax base along the periphery (due to population decline and migration to the urban core) caused local governments to stop providing many amenities like paved streets, lighting, water and sewer networks, and parks, for large housing developments. Suddenly, people living in such developments needed to finance those services themselves, which increased the costs of living along the periphery and further encouraged a return to the urban center. These factors caused a swift change and a return of residents to the city, however, it will take decades and millions of dollars in investment to rectify the damage already caused by urban sprawl. Five million homes now stand empty. Virtually all homebuilders are in bankruptcy. With low sales, developers had to bear the cost of operation of the urban complexes that have not been received by local governments, and incurred debt for excessive purchase of land reserves. Millions of people still live along the periphery without access to public transport and dwindling access to employment or education and health services. Despite these challenges, there are clear signs that Mexico’s current leaders understand the failings of the past and are making important policy shifts for the future. President Enrique Peña Nieto announced a new strategy for urban development and housing in order to build denser, more compact and accessible cities. Some of these efforts have materialized to make Mexico’s cities more sustainable and accessible, however, it is still unclear whether these new policies stand as a legislative bandage, or are the first signs of a larger shift in government mentality towards the shape and size of Mexican cities.